Tails Are Wagging provides two daycare options, full day or half day. Full day is considered all day any time from open to close. Half days are considered anything less than 6 hours. Daycare includes potty breaks and play times outside in a supervised 7,500 square foot secure play yard. There is room to run and play with new friends and shade for relaxing. We have multiple playgroups that are based on the size of dog. Your dog will also have indoor rest times with their own personal space that is big enough for them to lie down, walk around or stand up and stretch. We offer a free half day of daycare for your dog’s first visit. We like doing this so that your dog gets an opportunity to experience the play yard and meet us. It also gives us a chance to see how your dog interacts with other dogs. Please call to schedule your free half day of daycare with us for your dogs first visit. 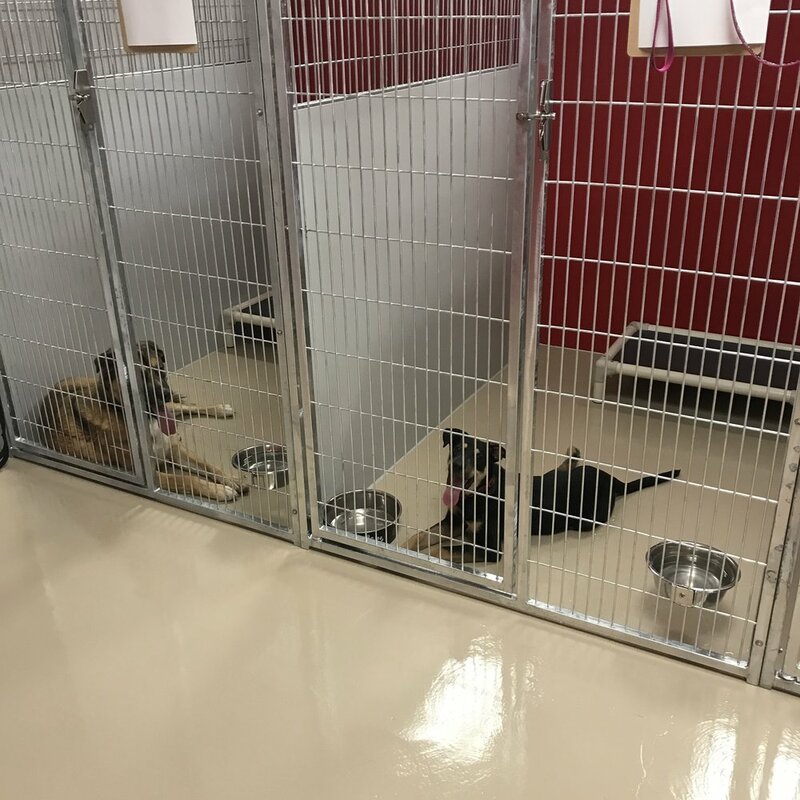 For our boarders, they get the full use of the daycare included with their boarding. Boarders are provided their own personal space during the day for breaks and naps and at night with enough room to walk around in and stretch. Boarders can be kept on their same feeding schedule, just like at home, whether you bring their food for them to eat or use food provided by Tails Are Wagging. We do encourage owners to keep their dogs on their regular food as opposed to changing their diet. There is a small charge of $3.00 per meal, for using food provided by Tails Are Wagging. All boarders go home with a free bath after staying 4 consecutive nights. All suites come with a TV for use during rest times during the day and Kuranda beds. Boarders that use our suites also get an extra one on one play time in the yard with one of our staff. Our boarding suites book fast so be sure to reserve in advance of your boarding dates. Tails Are Wagging provides bathing for your dog. You can stop by and bring in man’s best friend for a wash and dry or you can add it to a day of play while at daycare. In order for dogs to participate in the playgroups while here for daycare or boarding, dogs must be spayed or neutered. Puppies are welcome as long as they are at least 4 months old. Puppies between 4 months and 12 months old are not required to be spayed or neutered. All dogs using services at Tails Are Wagging must have proof of current vaccinations including distemper/parvo and rabies(every year or three years, depending on the vaccinations your veterinarian administers), 6 or 12 month Bordetella and the bivalent canine influenza vaccine (H3N2 & H3N8) annually.